We have such a huge selection of Human Skeletons that we have had to divide them over several pages. Be sure to check out everything so that you can find exactly what you want. 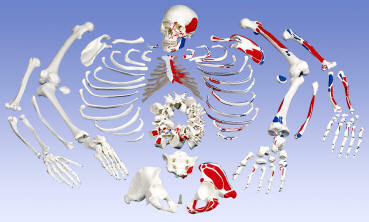 We also have Anatomical Models of individual joints, with and without muscles. LISTED SEPARATELY: Real Human Skeletons. Protect your investment with our heavy-duty protective cover. Suitable for all full size skeletons and stand versions. Black with transparent window.